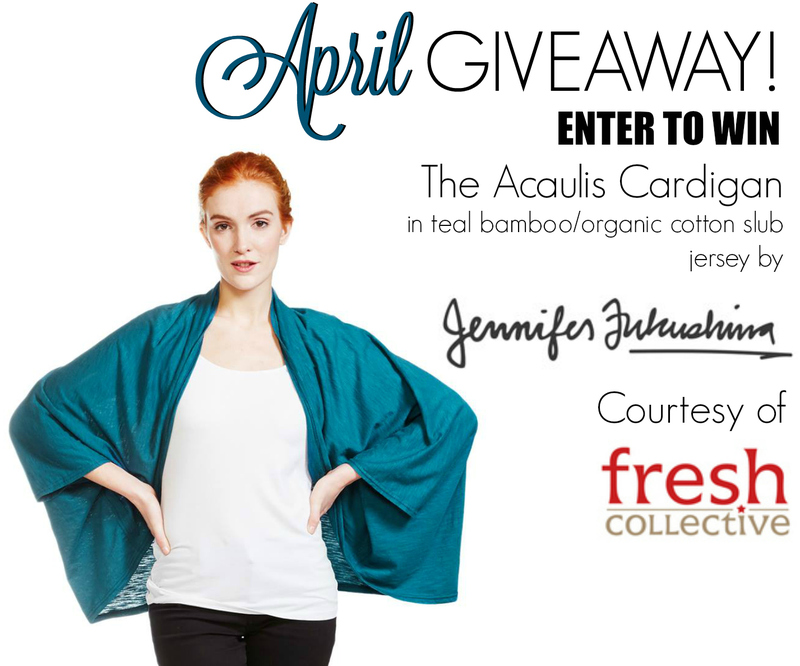 Designer Spotlight – Jennifer Fukushima – ENTER OUR GIVEAWAY! For April we’re focused on awareness: looking behind the scenes at what fashion brands do, and can do more of, to lessen their impact on the environment and create ethical working conditions. Toronto based designer Jennifer Fukushima has been a leader in eco-fashion from the beginning of her career, so she was a natural choice as a designer to feature this month. 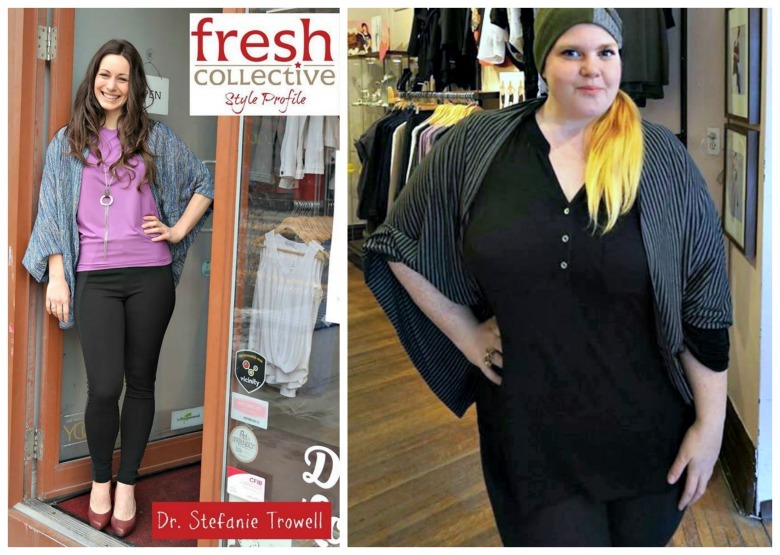 Here’a a look at her spring collection – plus you can enter to win a cardigan! Here are some looks at the Acualis Cardigan (which is the prize for the giveaway!) Available in grey, black, purple, teal and bright purple, this is an easy layering piece and one of our best seller for spring. Available to buy online here or in any of our 3 locations in Toronto. View a video tour of the cardigan here! Made of 55% Organic Cotton & 45% Bamboo Rayon (eco-friendly, comfortable and breathable) this is a one size garment that fits size 2 – 16+. Want to win one? Enter the giveaway below! Let’s meet Jennifer in her studio! Here she tells us about the inspiration for her designs, her commitment to running an eco-friendly business and gives an overview of the evolution of her brand. Also available in this limited edition “Holes” fabric, in grey or natural, The Acaulis Cardigan makes a versatile addition to almost any wardrobe! Wear it casually over post-workout wear or as a statement piece to keep the chill off at the office. We find our customers loving this style so much they come back for a second colour! Two more fabric choices for the wonderful Acaulis Cardigan: Tweed Knit (on the left) and Striped (on the right). Did you know Jennifer works to make her studio a zero-waste environment. She uses the smaller fabric pieces to make accessories, and donates the rest of the scraps to local craft groups. Don’t forget to enter the giveaway while you’re here! Draw will take place May 1, 2016 and winner will be notified by email. Freshly arrived this week is the Cassiope top from Jennifer Fukushima! Available in solids and in Purple Shibouri and Teal Shibouri, you’ll fall in love the second you feel the buttery soft bamboo fabric and see how it fits and flatters you. Did you know bamboo is regarded as an environmentally sustainable choice because it grows fast, in abundance and without pesticides. Bamboo is also a long lasting fabric that resists pilling, meaning that top you love will last many, many wearings and washings. Thanks for tuning in to learn a bit more about Toronto designer Jennifer Fukshima and to enter the draw! Good luck to all! Winner will be notified by email May 1, 2016. Introducing Pixie Mood~ Enter our giveaway for a Lei Backpack! There’s a new Canadian bag brand in town exclusively at our 401 Roncesvalles location and we’re falling in LOVE! Based out of Toronto Kelvin and Chloe are the couple behind Pixie Mood. Done with the 9 to 5 life they had with IBM Canada, they took the leap to combine Chloe’s love of design and fashion with Kelvin’s Business Management Major from Ryerson University. This great little 3 in 1 bag consists of 2 parts that can be clipped together and used as one bag or used separately to match your outfit and your needs. Kelvin and Chloe love animals and choose to have a vegan company using only non-animal products for their bags. They use “vegan leather” which is a durable yet soft polyurethane. “We strive to provide a cruelty-free option to those who love fashion and fun accessories,” say Kelvin and Chloe. There are times you just need a little wristlet, and Cameron is here for you! At $23 this is the perfect little go along, and Cameron even has a clip to keep your keys safe! Pixie Mood is designed in Toronto and manufactured in Asia. Kelvin and Chloe visit the factories at least twice a year and meet with the owners to ensure that the both the quality of their products and the treatment of the workers is up to their standards. Both are very important to them. 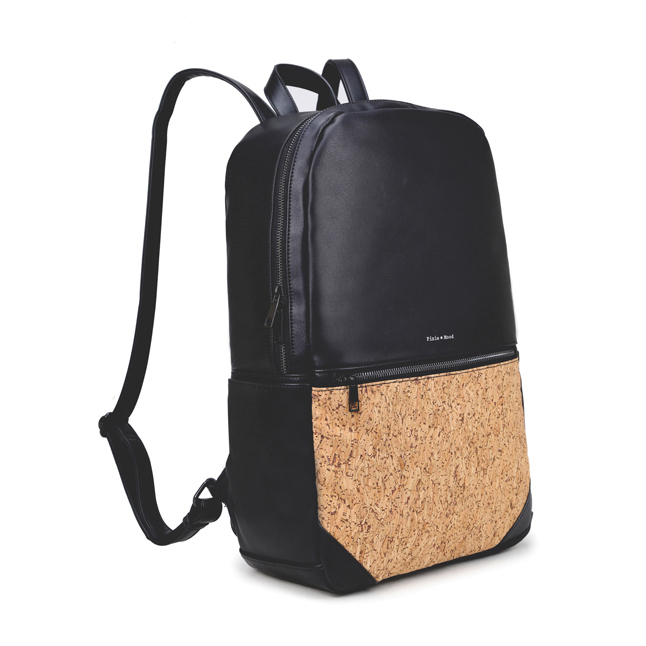 Designed with function and style in mind, the Lei backpack features a padded laptop pocket, adjustable straps and a stylish cork panel on the outer pocket. All this for the very reasonable price of $75. A chic backpack is a great choice for the urban professional woman. It means a hands free ride on the subway or streetcar, enough room to throw in your lunch, work shoes or gym clothes plus you look awesome and polished, ready for a great work day. Many of our customers are cyclists and love a great backpack to make their commute that much more fashionable. Drop in to our shop at 401 Roncesvalles Avenue in Toronto to see the line in person, or shop for Pixie mood online with confidence! See our shipping and returns policy here.